Yesterday afternoon my new cell phone arrived!!!! Hurray! Don’t get me wrong, my previous cell phone was working just fine… however it was a touch screen. And apparently touch screen and me do not make a very good team. 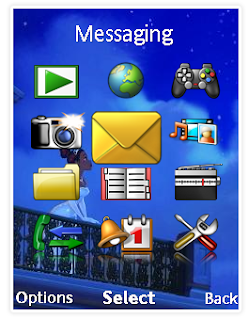 Somehow when typing a message I kept on pressing a wrong button at least ones every time! The phone came with my 2 year contract… so I was too proud to give in and buy a new one (after all, I was paying for the damned thing). But seeing that the contract will come to an end in the beginning of November and I will be switching to a Sim Only contract. I thought it high time to free myself from the annoying touch screen and get myself a different phone. I finally decided on buying a clamshell model, since I had one before and I thought it was quite convenient… Well truth be told, there wasn’t a whole lot of choice. Most models that they have been bringing out are either very simple and do not have a camera (worth mentioning) or they are extremely ugly. 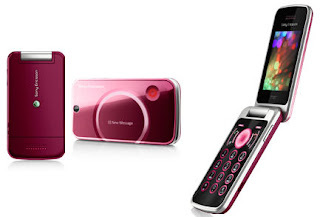 But then I found one that was to my linking: the Sony Ericsson T707. The phone came in three colours: black, spring rose and lucid blue. I eventually went for spring rose, since I thought the colour was rather nice. The colour is a little bit more pinkish than it looks on the picture, but it is still a really nice colour. The phone has some interesting features. Let’s start with the little screen on the front. 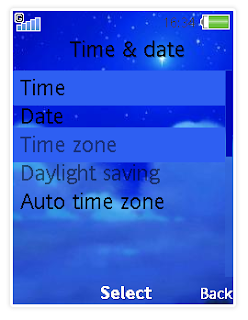 This shows you the time, how much battery you still have left and the amount of perception. Also the number/ name of the person that is calling you shows up on the screen and it also tells you when you have received a new sms. The white-ish circle around the small screen lights up when you get a call, along with a smaller light to the right side of the screen. You can actually give some of your friends their own light effect when they are calling you. Another very nifty feature is that when your phone is ringing and you do not have time to answer it (or just don’t feel like it) you can wave your hand in front of the camera and it turns off the sound…. And it actually works! How great is that?! Next to that the phone has a 3.2 megapixel camera… which is nothing to write home about really. But if you are in need of a camera because you are witnessing something special it might just be a life saver ;). Also it has 3G compatibility… Apparently this means that the internet speed is very high. I am not quite sure if I will add an internet package to my new contract, but maybe I will. All other options are just the basic fun stuffles. My current ringtone is ‘Down in New Orleans’ prologue. I placed the lyrics of the song in the picture that I use as the background for the front page. 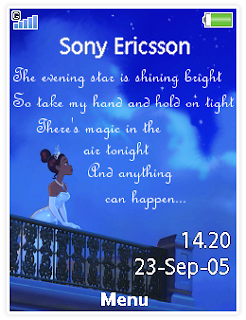 So I have a matching theme and ringtone :D. If you are interested in one of the songs of ‘The princess and the frog’ feel free to let me know ;). I have the soundtrack. Well so much for my ramblings on my new phone. XD It’s high time I get some work done here hahhaa. It is a very nifty phone though :3 I like it.